FILE - In this Oct. 8, 2018, photo, Philadelphia 76ers' J.J. Redick (17), Dallas Mavericks' Ryan Broekhoff (45), of Australia, 76ers' Joel Embiid (21), of Cameroon, Mavericks' Salah Mejri (50), of Tunisia, 76ers' Mike Muscala (31) and Mavericks' Maxi Kleber, of Germany, play in an exhibition NBA basketball game in Shenzhen, China. It was the final minute of a preseason game between Philadelphia and Dallas, the 76ers were up by four points with the ball, and thousands of fans were screaming "defense" at the top of their lungs. A common scene, with an uncommon detail: The game was in China. "Fantastic," Dallas' Dirk Nowitzki marveled. "Shows our fans are everywhere." That fandom, and the importance of those international eyeballs, just keeps growing. The NBA has been going overseas to play either preseason or regular season games for 40 years, and the global footprint of the league — not to mention its business interests — continues to expand. The league has opened up 12 international offices, establishing seven academies on four continents and started broadcasting games to more than 200 countries and territories. 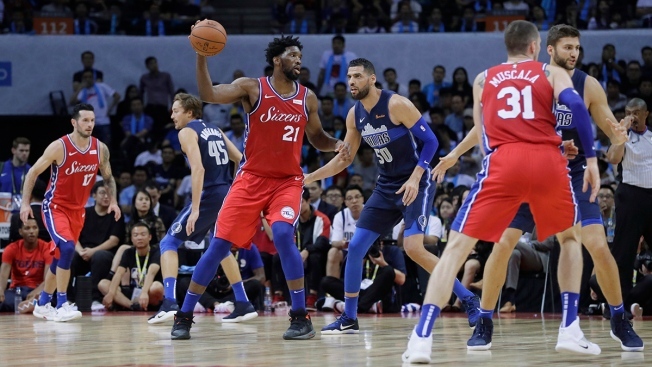 This season, the NBA heads back to Mexico and England for regular-season contests, after the 76ers and Mavericks played exhibitions in China earlier this month. "I believe we can be the No. 1 sport in the world," NBA Commissioner Adam Silver said. "When I look at the trajectory of growth, the fact that young people, boys and girls, continue to love this sport, are playing this sport, are engaged in the sport of basketball on social media or with online games, I don't know what the limit is." The numbers touted by the NBA are impressive: 300 million people playing the game for fun in China alone, rapid growth in India over the past decade as that country is on pace to become the world's most populous by 2025, an estimated 1 billion people around the globe — that's basically 1 out of every 7 people alive — having some access to the NBA Finals. But in terms of global popularity, soccer is still tops. The NBA model of academies seems to be loosely based on what soccer teams around the world have been doing for years; some of the top international clubs have set up those academies in the U.S., and the NBA is taking its academies into other parts of the planet. Simon Chadwick, a Sports Enterprise professor at Salford Business School in Manchester, England, urged caution when relying too much on data coming out of China. He said the NBA's benchmark in China is obvious, but that the league still needs to work hard "in new and emergent sports markets" if Silver's hope of basketball supplanting soccer is going to be realized. Jimmy Fallon and stars of the 2018 NBA Draft join forces for TGIF-style opening credits, with an original theme song, "Play-by-Play," written and performed by Jesse Frederick (he sang the themes to "Full House," "Family Matters" and "Perfect Strangers"). "Getting the strategy right across these different territories is going to be a crucial factor in any potential growth in basketball's global popularity," Chadwick said. "Will basketball become the world's favorite sport? It is not inconceivable, although it is unlikely — at least in the short to medium-term. It will need nurturing, careful management, sound strategy, and good judgment if it is to succeed." China's affinity for the game isn't truly understood until seen in person. Marvin Johnson moved from the Miami area to China in 2017 to teach and coach at a basketball academy there. The first thing he saw when he deplaned in Beijing was a massive Li-Ning store that was basically a shrine to Heat guard Dwyane Wade, who now has a lifetime contract to endorse the Chinese brand's products. "Anytime you go out to play basketball at a local court there is a plethora of NBA jerseys being worn by the players," Johnson said. "If you ask any local playing basketball, they can't name the players on the local Chinese Basketball Association team — but they can name their favorite players in the NBA in an instant." Wade and Heat teammate Udonis Haslem went to China this summer to promote Li-Ning. Everywhere they went, thousands of people were waiting, and that's now standard for when any big-name NBA player heads to Asia. LeBron James has made an annual trip to China for years. Stephen Curry dropped some Mandarin on fans there when he visited this summer. Kevin Durant played HORSE and didn't lose. Klay Thompson — or "China Klay" — lost at pop-a-shot. "Life is too short to be serious all the time," Thompson said. "You've got to be able to show your personality. That's what I do when I come to China." Going to places like China is fun, for certain. But it's clearly smart NBA business now as well. "It's been that way for years," Wade said. "They're not just fans in China. They're knowledgeable fans." Curry's summer might have epitomized the marriage between the NBA and foreign lands. He didn't just go to China. He also hit the Philippines, England, France and Japan. He tossed out the ceremonial first pitch at a Japanese baseball game. He shot around with soccer star Neymar. He watched a Premier League game in England. "One of the best summers that I've had," Curry said. Every major U.S. league has eyes abroad. Baseball opens next season in Japan with a two-game series between Seattle and Oakland. The NFL is playing three regular-season games in London in a three-week span that starts Sunday. The NHL is sending Florida and Winnipeg for a two-game series next month in Finland. "We know what the future looks like," NBA deputy commissioner Mark Tatum said. "When you look at China, India and Africa, you've got about 60 percent of the world's population in those three places. So we're putting a lot of time and energy in how we become the No. 1 sport in those countries and those continents." In China, where Yao Ming really got things started as far as the NBA growth, it's not uncommon to see fans watching streams of live NBA games on their phones during the morning commutes to work, since that's when those games are happening in the U.S. and Canada. A weekly highlight show on Chinese television typically draws an audience of up to 30 million fans. "I run into people here and they find out I work for the NBA and they say, 'I love Steph Curry or Ben Simmons' and they tell me different things about the game," said Derek Chang, the CEO of NBA China. "It's no different than being back in the U.S. and listening to sports radio in the morning. The intensity, the passion for it, it's pretty unbelievable. It really is a global game."